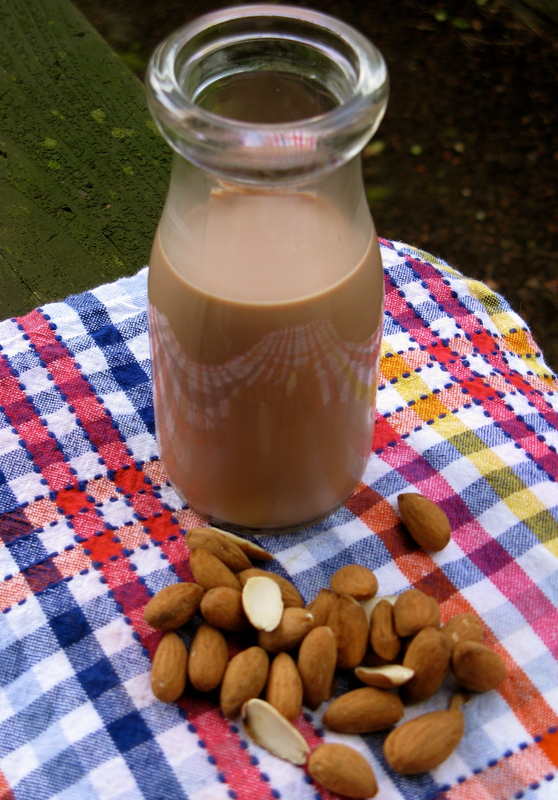 I’ve made homemade plain almond milk numerous times, and have been doing so for a while now. For some reason though, it’s never crossed my mind to make chocolate almond milk. I got the idea in my head about chocolate almond milk a last week, when one of my followers from the blog, Luv What You Do, left me a comment on my chocolate chip cookies post (with homemade chocolate chips) mentioning that she wanted to try making her own chocolate almond milk, without added sugars. That’s when the light bulb went off and I realized that I wanted to try it too! This almond milk came out incredibly creamy, with just the right amount of chocolate flavor and sweetness. If you like sweeter milk though, you may want to add more dates, but I personally don’t think it’s necessary. Pour the almonds into a large bowl and cover completely with water. Soak for 12-24 hours, changing the water once if need be. After almonds have soaked, pour into a colander and rinse very well. Next, add the rinsed almonds to a high powered blender, such as this one. *Pour in the filtered water, vanilla, dates, cocoa powder and sea salt. Blend on high for several minutes. Taste and adjust flavor as desired and blend again (if you added more ingredients). Pour the milk into a nut milk bag, and let drain over a large bowl for an hour or so. Then, squeeze the bag to drain out the remaining milk. Pour milk into a large jar or pitcher and store in the refrigerator. Enjoy it cold or heated, like a hot chocolate. It’d also be great to make ice cream with, if you have an ice cream maker. *Note: The draining process will turn your nut milk bag a little brown, due to the chocolate. If this bothers you, blend just the nuts and water first, drain, then add back to the blender with the remaining ingredients. Also, you can either save the almond pulp to use in baked goods later on (after it’s been dehydrated) or compost it. Yummy! Sounds great. By the way, what is Jesse’s favorite brand of dark chocolate? Thanks! He really likes Divine Chocolate (just plain dark) and Chocolve dark chocolate with sea salt and almonds. Sometimes, he buys Newman’s Own plain dark chocolate too. All of these are sold at Whole Foods. i’m just afriad I’ll overcook it or undercook it or eat the wrong part…help….i just went a simple method just to put the rabbit alone in a small roasting covered pan ….with nothing else, just the rabbit 🙂 I google recipes and everything is complex and involved with other hings…jeesh. I’ve never cooked rabbit or handled rabbit, so I’m really not sure. Did you search roasted rabbit in your Google search? Look for the simplest, most basic recipes or try finding recommendations for cooking time based on weight. Under-cooking isn’t a problem…you just test the temperature and if it’s not done, stick it back in the oven. If you’re really in a habit of consuming dark chocolate every night, try reducing your consumption by a few pieces or more each night until ideally, you’re eating very little to none. You’d be better off eating it earlier in the day too versus late at night, before bed, but I know nighttime is the hardest time for you. My other suggestion is to drink a good herbal tea instead, eat more at dinner (if you’re still hungry) or stop buying it (or buy less). I can only give suggestions, but it’s up to you to try and make the change! Don’t be so hard on yourself and give up too easily. Remember, complaining about it without taking action won’t get you anywhere. For stuff like this, a baby steps approach can work really well. Also, what do you think of carob powder? sweetend or unsweetened. I’m not a fan of carob, but if you’re going to use it, definitely use unsweetened. Do you have issues with cocoa/cacao? Does your blender have a decent amount of power? If so, it’s probably fine. Otherwise, it can be a little hard on it. 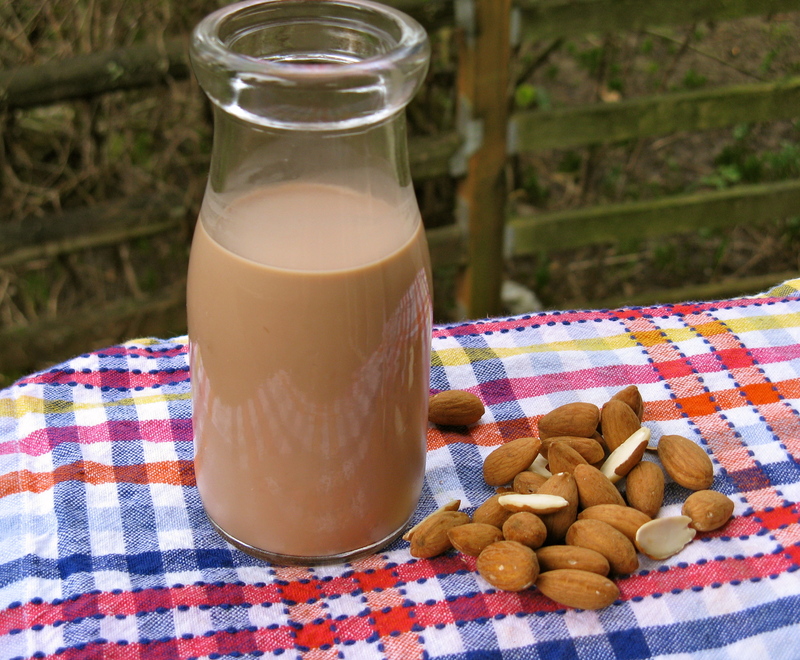 I just tried you chocolate almond milk and I must say, I loved it! I have been drinking almond milk for over a year though start making my months ago. I found it good for baking and pouring on my cereal but not so much for drinking. That is, until I found this recipe! Thanks again! Sorry. I accidentally posted twice. Do you need to take the skins off after you soak the almonds? No, it’s not necessary because it gets filtered out in the nut milk bag.